Presteigne St Andrews FC’s first team plays in the MMP with Norman Lloyd Mid Wales League, second division. The squad is made up of mainly local players with the bulk coming from the Presteigne-Leominster area. The main aim of this season will be to become a stronger side within the MMP with Norman Lloyd Mid Wales League, second division and to foster a good atmosphere within the club so players want to come to Presteigne and then – critically – stay here when they get here. Home matches are played at Llanandras Park and usually kick off at either 2.30pm on a Saturday afternoon or 7.30pm on a midweek night. However, such are the vagaries of the congested fixture schedule towards the end of the season that these dates and kick off times can alter. We will do our best to keep the fixtures tab up to date – to access this, hover your cursor over the ‘First Team’ tab at the top of the page and then click on the relevant season’s fixtures from the drop down menu that will appear. 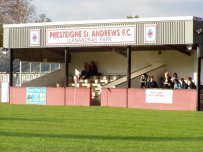 Admission prices for home games are £3.00 for adults; £1.50 for senior citizens and £1.00 for youngsters under the age of 16.